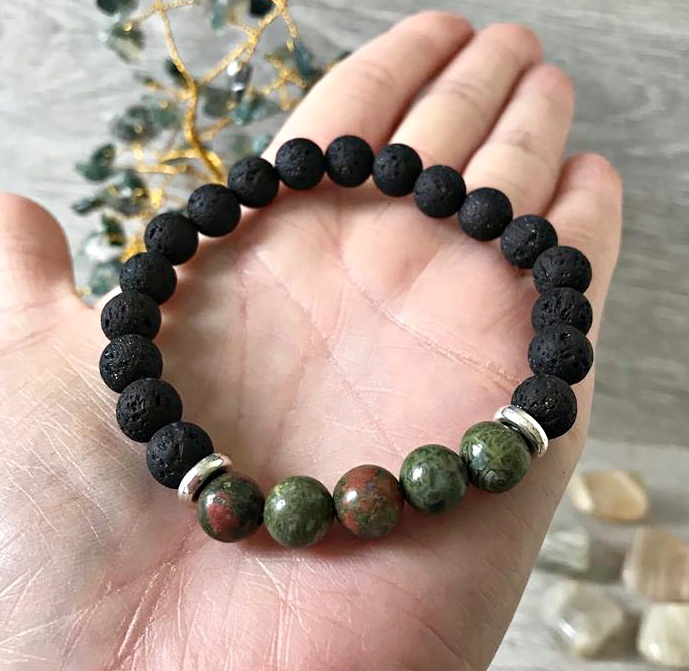 Lava Stone is known for its grounding abilities, wonderful for calming the emotions, a stone of re-birth helping to release the layers of unwanted emotional attachments. 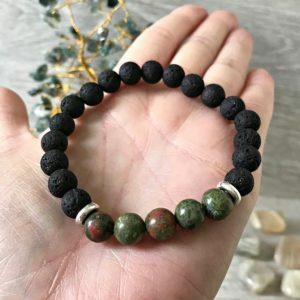 Spiritually lava stone is good for grounding and stabilising the root chakra this is because it has a very strong connection to earth. In years gone by it was given to soldiers to help them to remain calm while in battle. Lava stone can be left in a room for emotional clearance and energetic balancing. Unakite is typically, green with pink mottled effect, it stimulates healthy pregnancy, and looks after the health of the unborn child. Encourages hair and skin growth when necessary, giving strength when recovering from serious illness. It is said to absorb electromagnetic pollution, given off by computers, TV’s and phones giving you a better living environment.